What happens if they flip the switch to begin Obamacare's second open enrollment period next month and hardly anybody shows up? That's the eye-opening scenario suggested by a new poll that shows a very large percentage of people without health insurance are unaware that open enrollment in individual plans starts anew in November. 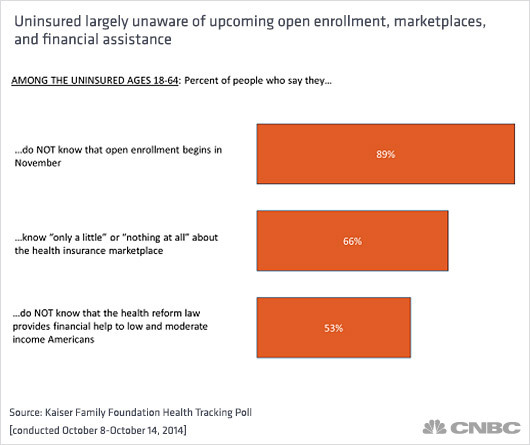 The Kaiser Family Foundation poll found that nine in 10 uninsured people did not know that enrollment starts again next month. Two-thirds of the uninsured respondents said they know "only a little" or "nothing at all" about the Obamacare insurance exchanges where they can buy health plans, often with the help of federal subsidies. More than half of the uninsured, 53 percent, did not know that those subsidies are available to people with moderate or low incomes, according to the phone poll, which questioned 1,503 adults between Oct. 8 and 14. Kaiser's findings about the uninsured suggest the hurdle for achieving a key goal of Obamacare—getting those without insurance signed up for health coverage—could be high this year, even after more than a year of media stories and outreach efforts about the Affordable Care Act. As of last month, about 42 million Americans were still uninsured, according to Gallup. Mollyann Brodie, who oversees the tracking poll for Kaiser, said, "What's striking is there isn't any carry-over from last year." When Kaiser conducted its research in 2013, it found a similar lack of knowledge among the uninsured. But unlike last year, when enrollment ran for more than six months, this enrollment period will be half that length, from Nov. 15 to Feb. 15. "I think a lot of work needs to be done," Brodie said. "We're at the very early stages of the second enrollment period, and right now one of the main target audiences is not primed or focused on it." More than 8 million people selected Obamacare plans on government-run exchanges such as HealthCare.gov by the close of the first open enrollment period in mid-April. While some of those enrollees were replacing individual insurance plans that didn't meet Obamacare's minimum standards, others had been previously uninsured. Multiple surveys have shown that the percentage of Americans lacking health insurance has decreased with the launch of the exchanges last year, as well as with the related expansion of Medicaid benefits to previously ineligible poor adults in more than half of the states. Still, no definitive figure has been released to show how many of enrollees were previously uninsured. An unknown number of the previously uninsured who bought Obamacare plans were effectively barred from the individual insurance market because they had pre-existing health conditions. Obamacare now prevents insurance plans from either refusing to sell coverage to such people, and from charging them a higher premium than healthy enrollees. Brodie said that to the extent those people were "long-hanging fruit" for Obamacare, their strongest effect on overall enrollment "probably happened last year." That leaves the remaining uninsured, who are "definitely a hard group to reach," Brodie said. Most of those who expect to remain uninsured next year told Kaiser they didn't think they'd be able to find affordable plans, she said. Despite their overall lack of awareness about many aspects of enrollment, nearly 60 percent of the uninsured said they will get covered in the next several months, either through an employer, private insurance plans or Medicaid. The ACA now mandates that nearly everyone have some kind of health insurance or pay a financial penalty. That penalty, which was the higher of 1 percent of taxable income or $95 per individual for 2014, rises to 2 percent of taxable income or $325 per individual in 2015. Republicans last year were optimistic that the disastrous launch of HealthCare.gov and several other state-run health insurance exchanges would help them in this fall's mid-term elections. But Kaiser's survey found that Obamacare "continues to be a second-tier issue on voters' minds," with many respondents saying "they are tired of hearing candidates talk about the law," a report on the survey said. Asked to pick the "most" important issue for this fall's elections, "just 8 percent pick health care, ranking behind the economy (16 percent) and dissatisfaction with government (12 percent) and similar to other issues like education (10 percent), the situation in Iraq and Syria (9 percent), and immigration (6 percent)," the report noted. The same poll showed Obamacare has much less effect than other issues on how people plan to vote in next month's congressional elections. 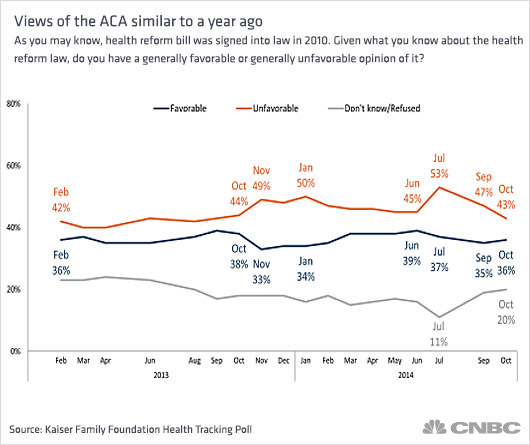 Public opposition to the health-care reform law is significantly less heated than in July, when a high of 53 percent had an unfavorable opinion about the law. That level is now down to 43 percent.